Become an expert at making these Teriyaki-Glazed Water Chestnuts with Bacon. Soon your family will be asking for these water chestnuts at every party. 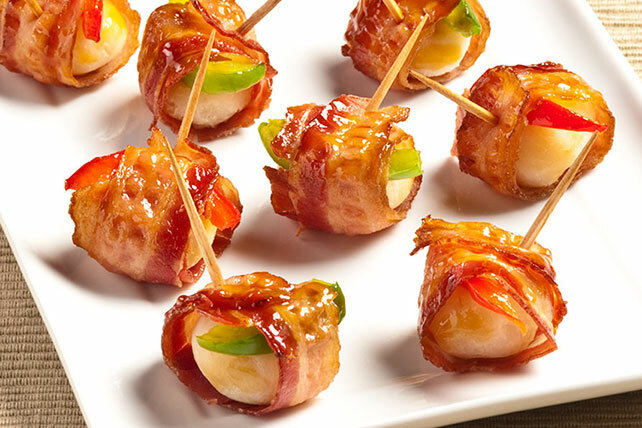 Wrap bacon around water chestnuts and peppers; secure with wooden toothpicks. Place in shallow baking dish; brush with glaze. Bake 10 to 12 min. or until heated through. Discard toothpicks before serving. For a festive touch, prepare using a combination of red and green pepper strips. Appetizers can be assembled in advance. Refrigerate up to 2 hours before brushing with glaze and baking as directed. The number of water chestnuts in an 8-oz. can vary greatly. If using smaller water chestnuts, cut bacon slices in half before using as directed.